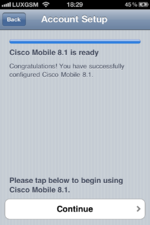 Cisco Mobile 8.1 supports multitasking. 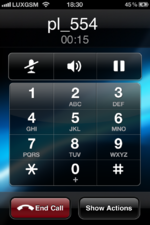 It requires Apple iOS 4.2 or later and is supported on the following Apple handsets: iPhone 3GS, iPhone 4, 3rd and 4th Generation iPod touch, and iPad. 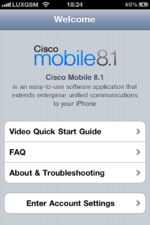 If you use an iPhone 3G, please download Cisco Mobile 8.0 instead. 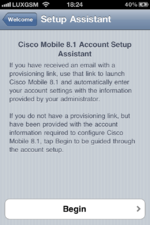 To add a new CISCO mobile SIP client follow these instructions. 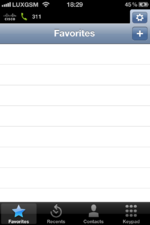 Add a new phone in webadmin. Write down the phone number and the autogenerated password (or insert a new one). 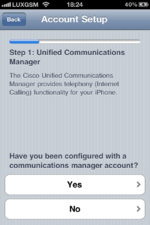 You will need both to configure your Cisco Mobile app on your iOS device later. 1. 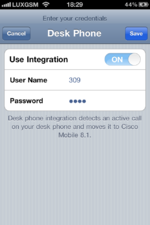 Download Cisco Mobile APP from iOS App Store. At time of writing the actual release is 8.1 and it is an iPhone only app (meaning not iPad). 3. Touch "Begin" on the wizard start page"
5. 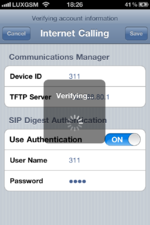 Slide "User Authentication" to "ON". 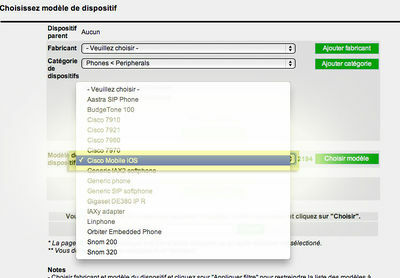 Enter your phone number on "Device ID" AND on "User Name". Enter your password on "Password". 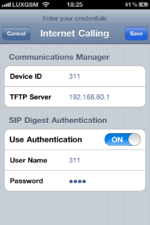 Enter your core's IP address as TFTP server. Touch "Save"
7. 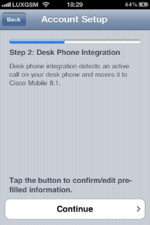 When it asks for "Desk phone" integration enter "Continue"
8. On Desk Phone page touch "Cancel" as we don't have that integration. 9. 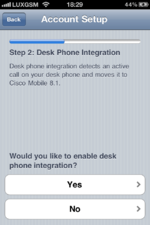 Touch "No" when it asks for "Desk phone integration"
10. 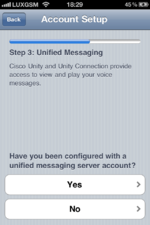 Answer "No" for "Unified Messaging"
11. 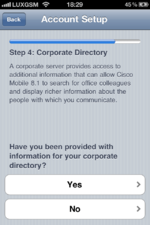 Answer "No" for "Corporate Directory"
12. Congratulation. Setup is done. Choose "Continue". Your SIP softphone should be ready. This page was last modified on 20 November 2011, at 18:09.